Named after shoemaker William Copp, Copp's Hill Burying Ground is the final resting place of merchants, artisans and crafts people who lived in the North End. Located on a hill on which a windmill once stood, the land was given to the town. 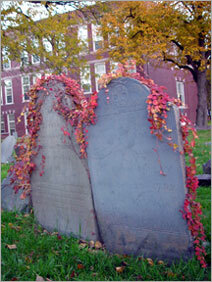 Copp’s Hill was Boston’s largest colonial burying ground, dating from 1659. While most of the people buried in Copp’s Hill are ordinary Bostonians, with some notables such as Cotton and father Increase Mather, two Puritan ministers closely associated with the Salem witch trials; Old North Church sexton Robert Newman who is thought to have hung the lanterns on the night of Paul Revere’s midnight ride; and Edmund Hartt, builder of the USS Constitution. It is believed that close to 1000 free African-Americans who lived in a community on the current Charter Street side of the cemetery are also buried at Copp’s Hill Burying Ground. Because of its height, the British used this vantage point to train their cannons on Charlestown during the Battle of Bunker Hill in 1775.